My cousin Kristen is expecting her first baby boy in December who will be named after her daddy, who passed away this past June. His name will be Tony Briggs Doster, and there’s not a doubt in my mind that he will be so loved and just as beautiful as his Momma and Daddy. She is glowing! This baby is such a gift from God, and our family can’t wait for him to make his arrival! When she asked me to take these pictures for her, I was so excited. Kristen and I are almost exactly six months apart and grew up playing together in our grandparent’s back yard (they were next door neighbors), having sleepovers full of Mary Kate and Ashley marathons and popcorn with M&M’s, and our moms dressed us alike every chance they got. It’s hard to believe we are already old enough to be married and starting our families. I’m so glad we got to grow up together and I can’t wait to raise our babies together one day! I just wanted to share a few of my favorites from our session! *Please note: The photos above are my own and may not be used anywhere for any reason without written permission from me. Okay, okay… I know it’s not even Thanksgiving yet…. But I can’t wait to mail out Christmas cards this year! I have always loved getting and sending out Christmas cards. Some of my sweetest childhood memories from Christmastime are of racing to the mailbox every day during the month of December, looking through the cards we got from friends and family, dragging a dining room chair through the living room so I could reach, and hanging them on the door in our living room with scotch tape, starting at the top and working our way down as they kept flooding our mailbox. We had them all hanging up on display and our visitors would stop to admire all the pretty cards we’d received as they came and went during the hustle and bustle of the holiday season. For me, Christmas cards are a reminder of home, a reminder of traditions, a smell of sweet cinnamon coming from the kitchen and a twinkling pine tree that I picked out myself on my uncle’s farm. They’re one of those things that, if we don’t keep the magic alive, could easily fall through the cracks and quickly become a thing of the past. Let’s keep the magic of Christmas cards alive. Even if it just causes you to pause and read a sweet sentiment in the middle of what can be a busy, stressful time of year. It’s special. Take the time to let someone know you’re thinking of them this Christmas… sometimes that’s the sweetest gift you can give. YOU GUYS! I love food… so much. So naturally, this time of year is my favorite. It’s dangerous, I know. You know what’s even more dangerous? Pinterest. Yeah, it’s one of my biggest weaknesses, for sure. Pinning new recipes is one of my favorite things to do. So, today I thought I would share a few of my latest pins that I can’t wait to try. I’ve linked the recipes, so if you try any of them before me, please let me know how they turn out! Happy cooking (and eating)! Um, everything about this sounds (and looks) amazing to me. First of all, I love guac. My favorite place to get fresh, homemade at the table guac is Cantina 1511 in Charlotte. If you haven’t tried it… you’re missing out. Anyway, these little cuties look like they would make darling appetizers. I love spinach and cheese stuffed shells, but I’ve actually been wanting to try this recipe with my own spinach and artichoke dip (see recipe at the end of this post). I think it would be amazing, but I’m not sure how it would change the cooking time dynamics. If I get brave enough to actually give this a try, I’ll let you know! If I could go to Olive Garden and get unlimited soup, salad, and bread sticks every day… I would. There’s something so comforting about the buttery goodness of the soup and bread sticks paired with the fresh tangy salad that I just love. This copycat recipe has been on my “to try” list for quite a while, and my goal is to make it before Christmas. It sounds extra good because it has… drumroll please… bacon! YUM! I love oreos, I love fudge, and besides… fudge is like a trademark of this time of year. Some of my best childhood memories are watching my grandma slice her cookie sheets of home made “candy,” and I wish I had learned her recipes. This just looks so good, I can’t wait to give it a try. Please note: All of the recipes and photos in this post were found on Pinterest and are not my own. I do not take credit for any recipes or photography. Mix everything in a bowl, holding out about a half cup of mozzarella cheese to add to the top before baking. Spray baking disk with cooking spray, put mixture in dish, sprinkle with cheese. Bake at 375 degrees uncovered for 20 minutes. Serve with tortilla chips immediately. Two dear friends of mine, Corey and Amanda, recently started a beautiful ministry called the Joy Womb Project. I love their heart for this pro-life ministry, and they have already seen such profound goodness of the Lord through it. Lives are being saved! The ministry is unique in the sense that they work with other organizations to seek out abortion-minded women, put them in contact with Godly counsel, and shower them with gifts for their new babies when God changes their hearts and shows them the value of life. The gift for these women that Corey and Amanda provide are diaper cakes. They view each little rolled diaper as a seed, used to sew the goodness, love, faithfulness, and provision of the Lord. 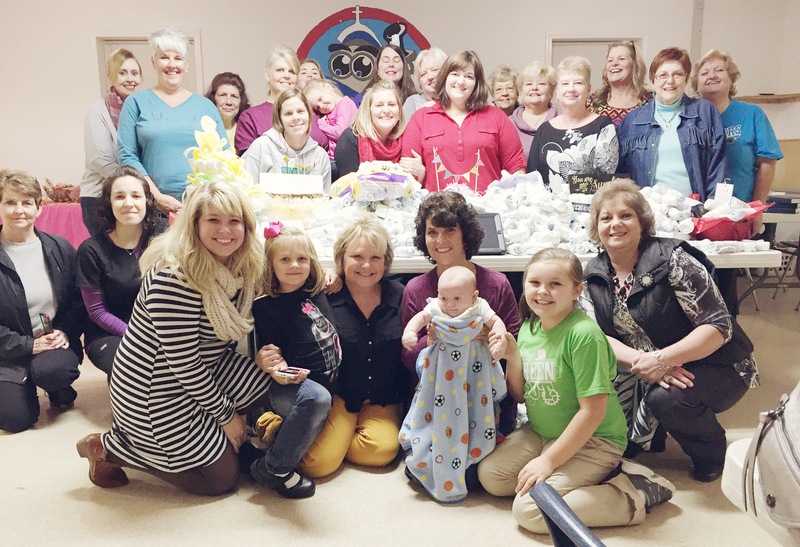 On Friday night, Women of Grace at Calvary Baptist Church hosted the first ever diaper rolling party for the Joy Womb Project, and it was pure JOY! About 25 of us gathered in our fellowship hall, where we ate tacos, fellowshipped, learned about the Joy Womb Project, and then rolled diapers for Corey and Amanda. Each lady brought with her a package of diapers, and together, we rolled over 1,500 diapers! It was so much fun, and the laughter from that room could be heard all the way down the street! After all the diapers had been rolled, we joined hands in a circle and prayed over those little seeds. We prayed for the mothers of those babies, for the fathers, for their health and relationships with Christ, for the doctors, for the churches that might be able to wrap their arms around them… and all the little details in between. It was a wonderful night, and we all left that sweet place refreshed and inspired. If you’re interested in hosting a diaper rolling party, email Corey or Amanda (thejoywombproject@gmail.com) or send them a message on Facebook! They are so excited to answer this call God has placed on their lives, and with your help, more and more women can have a part in saving these precious, innocent little lives and reaching these mothers for Christ! Our hearts desire is to see mothers wrecked with the Gospel of Jesus in our cities, to restore joy back to the womb of our Creator and for them to choose LIFE for their unborn baby. We pray that our diaper cakes will be such a beautiful blessing and such a sweet reminder to the mothers of the kindness, goodness, grace, mercy and love of our God as they unwrap their diaper cake and begin to use each diaper the first days, weeks and months at home on their new baby! Two years ago, my college sweetheart got down on one knee and proposed to me in the sweetest, most unexpected way. 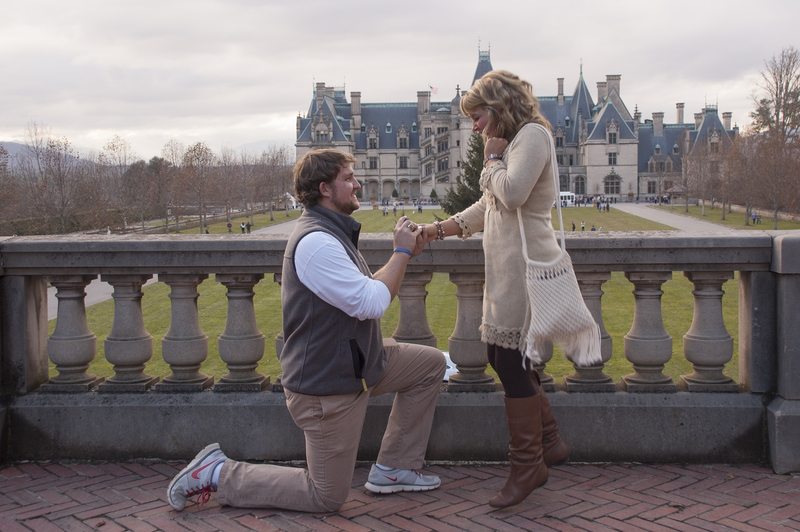 We were spending our two year (dating) anniversary at the Biltmore House and he had arranged for two of our dear friends (who are now also married) to meet up with us and take pictures and video of the proposal. Dream life. Seriously, I have a gem of a man. This is one of my favorite days and sweetest memories. 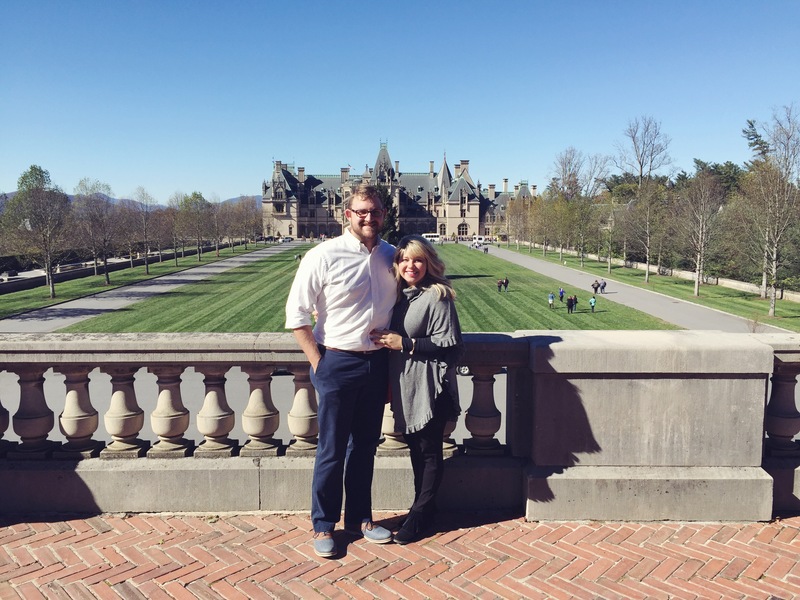 We love returning to Asheville to relive that day, and it seems that no matter how many times we revisit Biltmore, it never gets old. The beauty, the charm, the history… it just captures us and we love spending the day there. 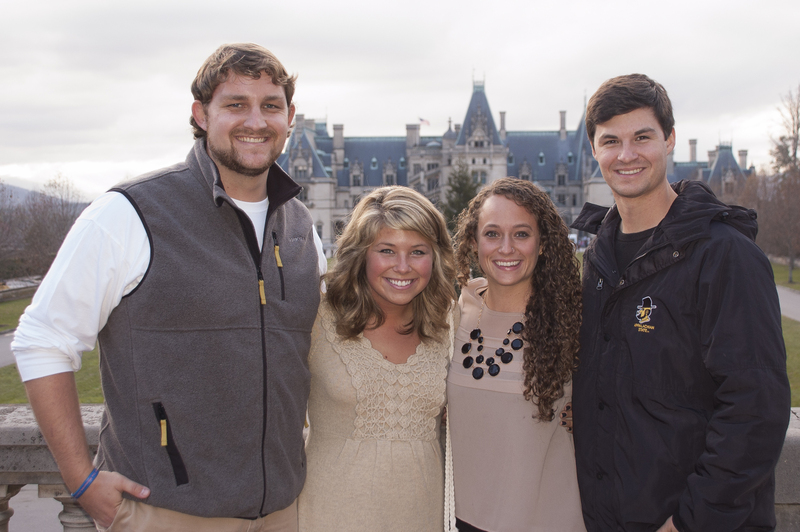 This weekend, we made our way back to Asheville and had the best time! We drove up early Saturday morning and spent the majority of the day on the Estate. It seems like no matter how many times we go, it’s always fun and we notice new things about it that we love. Of course, we had to take a picture in the spot where he proposed two years ago. After a day filled with laughter, salted caramel filled dark chocolate truffles, and chilly but beautiful fall mountain weather, we made our way to dinner. We had asked friends for suggestions and done lots of research, wanting to have a special anniversary dinner. We finally decided on The Corner Kitchen and were so pleased with our experience. They have a small, but impressive menu that changes daily and we could hardly choose because everything sounded so delicious. Grayson got peppered tenderloin of beef with mashed potatoes, asparagus, and a mixture of oysters, mushrooms, and tomatoes that he described as heaven on earth (I didn’t try it because I don’t like oysters). I got a pork chop (that, I swear was 3 inches thick) topped with a creamy buttery sauce and served with a barley risotto that was absolutely delicious and so flavorful. We had briefly mentioned to our server that we were celebrating our anniversary, and after dinner, he surprised us with a complimentary dessert and two glasses of champagne! It was so sweet! After checking into our hotel, we ventured downtown to the French Broad Chocolate Lounge, a place I had been dying to try for quite some time. IT WAS AMAZING! 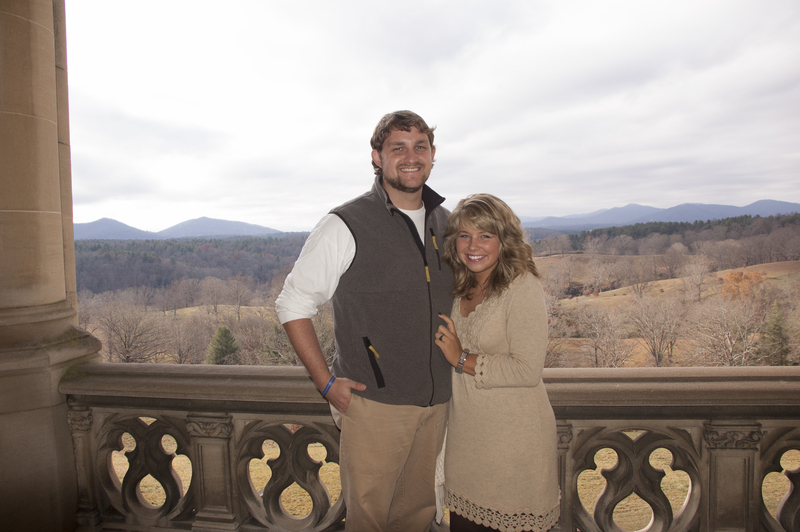 Grayson and I both fell head over heels in love with this place. When I say “amazing,” I mean like, game changing chocolate status. It was unlike anything either of us had ever had before. There was a line outside in the cold to get in, but now after experiencing it for myself, I would wait in that line 100 more times… because it was just that good. There were so many choices, but we finally made our decisions. Grayson got a salted caramel liquid truffle, a coconut macaroon brownie, and a chocolate snickerdoodle. I got a milk chocolate liquid truffle and a dark chocolate and salted caramel mousse trifle. The liquid truffles were our favorite, but everything was to-die-for. The atmosphere is so much fun, and sitting on the cozy little couch pigging out on all this delectable chocolate with my sweet husband was the perfect ending to the perfect day! 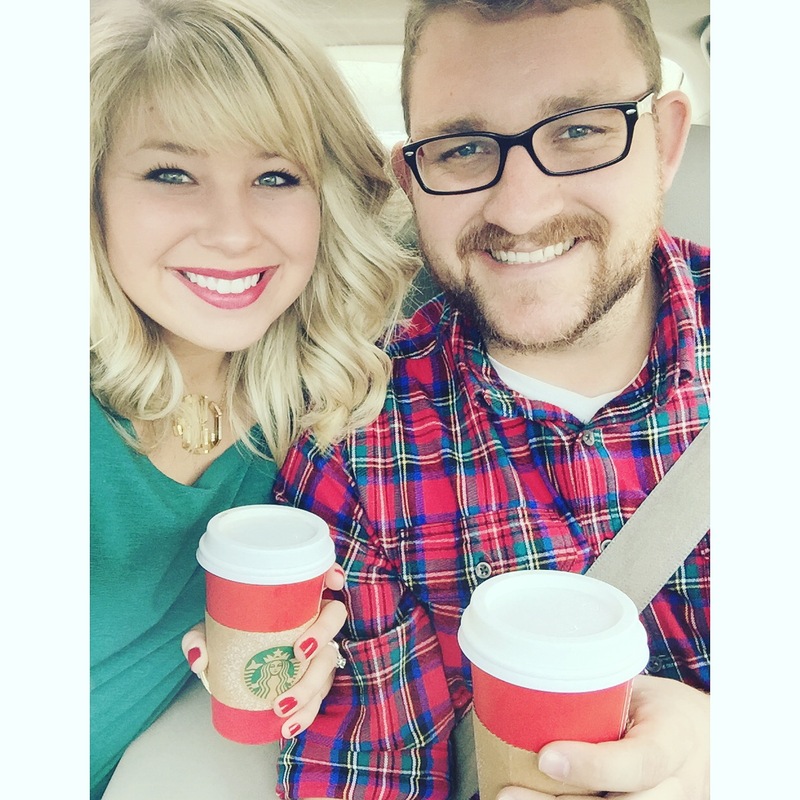 On Sunday morning, we ate breakfast at the hotel, stopped by the Asheville Farmer’s Market, and swung by Starbucks for our first red cups of the season. We love red cup season! It was a wonderful little getaway and I’m so thankful to get to do life with a man who loves adventure, travel, traditions, and trying new things as much as I do. He’s my biggest blessing, no doubt. We may have only been married for (almost) a year, but we’ve been dating for four, and it will always be my favorite anniversary to celebrate. Having a man pursue your heart and point you closer to Jesus is the greatest gift. I was in English class, with Mrs. Holman. We had a pocket folder with brads that served as our “journal,” and every morning, the first ten minutes of class were spent answering a writing prompt that she had written on the board. Most of my classmates hated it, but it was one of my favorite parts of the whole day. I looked forward to what the prompt might be that day, and I loved going back through the pages, reading what I had written in the months before. Mrs. Holman was one of the few teachers I ever had that really went out of her way to encourage my writing. I remember the green check marks of approval throughout my paragraphs, her words of praise after turning in big papers, and I remember her pulling my Momma aside at a basketball game one night saying, “Katie has a real gift for writing.” Of course, encouraging and helping uncover student’s gifts is all part of a teacher’s job – I see my husband do it every day with his own students – but for some reason, her encouragement did more than just make me smile… .it made me want to write even more. I’ve been doing some serious soul searching lately about the words I say to others. I’ve been asking myself questions like, am I being intentional with my conversations? have I taken every opportunity to find the good in others today? did I take the time to let so-and-so know that I see they have a real gift in a certain area? Sometimes all it takes is a word of encouragement or a reminder of a time when someone really pointed out a gifting. Sometimes it’s something small that we don’t even expect anyone to notice… Just a quick word can make us not only thankful that someone noticed or took the time to lift us up, but make us want to be better. What a gift. Why not take the time to, as my pastor says, catch someone doing something right? You never know what a difference it could make it their life. It might just make such a difference that they end up writing a blog post about it years later (thanks, Mrs. Holman!). This song (by Casting Crowns) just blesses my heart every single time I hear it. I love listening to radio stations like 106.9 The Light and K Love 94.1 because songs like this are so encouraging and uplifting. It’s amazing, really, how just hearing words like this can sometimes turn your whole day around. I love the reminder in this song of Psalm 46:10, “Be still and know that I am God.” It’s so easy to take our eyes off of Jesus, to focus more on whatever problem we’re facing rather than our Father who loves us and has a perfect plan for us, but when we focus on Him, it’s so much easier. He has our lives in His hand, and He will always make beauty from the ashes. I remember looking down at the pretty bracelets on my arm that a dear friend of mine, Lee Lankford, had given me months before. She had made them out of beads and wire, and I loved them and wore them every day, but the thought of making them myself had never crossed my mind until that day at the daycare. When I got off work at 5pm I drove my broke college student self straight to Michaels, the only craft store in Boone, where I spent $48 of the $50 I had to my name on beads, wire, pliers, wire cutters, and a small tupperware box. I sat at the desk in my dorm room that night and made bracelets until the sun came up. I was exhausted, but it was like something came over me and I just knew that Jesus was going to use this. The first onecouple of bracelets I made were not the prettiest things in the world (it definitely took me a while to get a hang of it) but I soon began to see the fruit of my labor take shape and pretty little bracelets that I could hardly wait to share with the world. These bracelets weren’t just bracelets to me. They were a plane ticket and a bumpy landing into Port au Prince. They were new shoes for my Haitian friend, Junie. They were the money used to pay the sweet Haitian ladies that cook for us at the hospital in Jacmel where we stay, helping them provide for their families. They were the money for repairs and renovations at the hospital and church where we serve in Jacmel. They were so much more than bracelets. The next day, I took them to work with me at the daycare and I not only sold every single bracelet that I had made the night before, but had orders for almost 100 more. Clubs, sororities, church groups, sisters, friends… they all wanted my bracelets. I was floored. It’s amazing what God will do if you’re obedient to Him, and I’ve never seen that more true than with these bracelets. Soon after that, doors began opening at local boutiques and hair salons…. all wanting to sell my bracelets. I shared with each person the story behind these twisted pieces of wire and beads, so excited to have opportunities to tell them about the Haitian people. Soon after that, I outgrew that small tupperware box. It wasn’t long after that I chose a name for this blooming ministry: Renmen Abonde, meaning “love abounds” in Creole (the beautiful language of my beloved Haitian friends). The rest, they say… is history. And to me, it’s the sweetest, most precious gift. Jesus used people in my life in such incredible ways through this journey. People opened their homes to me for bracelet parties, where they decorated, provided snacks, and invited all their friends- all the while providing me with yet another opportunity to share the mission behind these bracelets, explain what God is doing in Haiti, and give people and opportunity to be a part of the wonderful revival that’s happening there through willingness to share the Gospel with them. Churches invited me to come share, strangers sent me extra donations for the cause, accompanied by sweet letters of encouragement. It has been more of a blessing in my life than I could ever explain. As we prepare for our upcoming trip to Haiti this December, I know without of shadow of a doubt that it’s going to be special. Going back to see my brothers and sisters in Christ, continuing to build relationships with them, and see the growth they’ve experienced since I saw them last, warms my heart in ways that only Jesus can. Please continue to pray for our team from Calvary Baptist Church as we prepare for our trip, pray for the Haitian people- that they will continue to learn and love Christ, and that healing, restoration, growth, and revival would happen like never before. Renmen Abonde has (including this upcoming trip) helped send both Grayson and me to Haiti two times, helped support a team of guys from our church that went to Haiti last December, fully sponsored a child from our church to go to summer camp, which had a focus on missions, and has been used in every way we could find to support both local and global mission work. There’s not a doubt in my mind that God allowed me the privilege of this ministry for this season of life. It’s been such a sweet season, and I’ve seen His faithfulness and provision through this in every way. However, after much prayer, I believe that this season of life is coming to a close. Merry Market will be Renmen Abonde’s last big outreach, and after the current supply of bracelets are gone, this ministry will come to an end. There aren’t enough thank you’s, not enough hugs, not enough words to ever begin to thank each and every person who has believed in me, supported this cause, encouraged this mission… I am so humbled and eternally grateful to the gracious hearts who have helped make Renmen Abonde so successful. I have been pushed, challenged, and stretched through this journey in the sweetest ways, and God gets all the glory. His love for us is so powerful, His plan for us is so much bigger than we could imagine, and this story is proof that He doesn’t call us to be able- He calls us to be available. When we make ourselves available and say, “God, use me,” our request will never be ignored. It might be through beads and wire, it might be through making pies for our neighbors, it might be getting out of our comfort zone and completely moving to a new place to share the Gospel, or it might just be through mowing someone’s yard for them, but God will show you. He always provides a way. With all this being said, I hope to see each and every one of you this Saturday (11/7/15) at the Grand Hall in Mount Holly, NC for Merry Market 2015. I love everything about the heart behind Merry Market and I’m honored to be one of the 48 local artisans offering handmade goods at this craft fair. Bring your friends and stop by Renmen Abonde’s booth between 10-4. The address of the Grand Hall is: 400 East Central Avenue Mount Holly, NC 28120. I can’t think of a sweeter way to bring this season of ministry to a close than by sharing it with you all at such a sweet, special event. See you there! This past Sunday night, my pastor’s son preached our evening sermon. He is also a pastor and although he’s only 29 years old, he is full of wisdom and God is using him in an incredible way. It was a real blessing to hear him share what the Lord had laid on his heart. He spoke about our identity in Christ, how we find that, and how we can stop trying to find our identity in other things. For me, it’s such an easy thing to do without even realizing that I’m doing it… placing such value in things of this world (things that aren’t even “bad” things, just cherished things) so much that I find my worth in them rather than in my Father. He shared with us an illustration that resonated with me in a powerful way. He talked about driving through the mountains and coming to a small, rickety bridge with a weight limit prohibiting large vehicles from crossing it. He talked about how that little bridge was not made to carry the weight of large loads, and if say, an 18 wheeler tried to pass, the bridge would collapse. His point was this: how often do we entrust the weight of our lives to things (or, if you’re like me- people) that were not meant to carry us through? The most precious, Godly husband. The most understanding, supportive parents. The most faithful, well-meaning friend. None of them can carry you through this life. Only Jesus can. He is the only thing that we should expect to carry us, support us, and sustain us. And the best part? All we have to do is ask. His love is a free gift that He gives freely and He longs for us to reach out and trust Him to bring us through the inevitable valleys of life. Now, don’t get me wrong, a good support system is one of life’s biggest blessings. I wouldn’t trade my husband, Momma, or friends and sisters in Christ for anything in this world, but it’s Jesus who I have to trust to be my rock and my fortress.